Warp Drive - could such a thing actually be built? The "Warp Drive" is quite a well-known concept, chiefly because of the sci-fi series "Star Trek", with Captain Kirk frequently calling out things like, 'Warp factor eight, Mr Chekov'. But, could such a thing ever be built in reality? Well, first of all, let's examine the science behind the USS Enterprise's "hyperdrive", as it was called in the pilot episode. Apparently, the huge amounts of energy required for the warp drive was generated by bringing together amounts of deuterium and anti-deuterium in a reaction controlled by dilithium crystals. This energy then generated an area of "subspace", containing the ship in a bubble of normal space. Within subspace, the constraints of normal space didn't apply, enabling the Enterprise to exceed light speed by many factors (the different warp speeds). All well and good, but lets hold this up against real science. One, it is true that the mutual annihilation of matter and antimatter would result in tremendous amounts of energy, but the problem is, antimatter would be very difficult to produce in the large quantities required. Three, there is no such thing as "subspace". So, is an honest-to-goodness warp drive possible in reality? In 1994, Mexican physicist Miguel Alcubierre (who was also an avid Star Trek fan) decided to look into the possibility of building a real "warp drive" - that didn't violate Einstein's general theory of relativity. This states that matter cannot be accelerated up to, and beyond, the speed of light. So Alcubierre had the idea that, like in Star Trek, the spaceship would be contained within a bubble, around which space itself would be manipulated. It is known that space can be affected by gravity and that it can be stretched (as the Universe expands, so does space). Alcubierre proposed that, if space can be compressed in front of the bubble and expanded behind it, then the bubble would be carried along by the resultant "wave", reaching its destination in less time than a beam of light would. It doesn't flout Einstein's theory, because, within the bubble, the ship is isolated; it is not travelling faster than light because it is space itself that is moving (and space can travel faster than light). 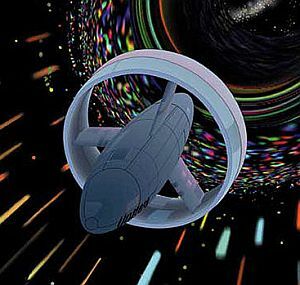 Here you can see a NASA depiction of the Alcubierre drive, showing the lattice of space-time in three dimensions, instead of the actual four. The raised portion is the expanded space and the lowered portion the compressed. Any object residing within the circular bit between them doesn't experience any feeling of motion, yet is being carried along from left to right by the wave. Space is being "warped"! Here we have the first problem. "Exotic matter" consists of particles that deviate from known properties of standard particles and are, in many cases, theoretical. The goal of the Alcubierre drive is to produce negative energy, however, and physicists are currently conducting experiments to create this type of energy. But then, we have the second problem. One estimate of the energy required to enable a vessel to go gallivanting across the Galaxy is the mass-energy equivalent of the whole of the observable Universe. Alcubierre was a little more conservative, suggesting that the mass-energy equivalent of something like the planet Jupiter would be required. When you consider how much energy (explosive power) is released by a nuclear weapon with a plutonium core with a diameter of a matter of inches, you'll realise what sort of energy amounts we're looking at. In 2012, NASA physicist Harold White returned to Alcubierre's equations and calculations and had a "eureka" moment. He realised that, if the flat ring round the spacecraft was altered in shape, to more resemble a donut, then the energy required would be greatly reduced - to something that was within the realms of possibility. He is leading a NASA team to create a warp drive! Experimentation is very much in its infancy. An instrument called an interferometer is being used to measure minute anomalies in spacetime. Lasers are being used to affect these anomalies, producing a microscopic Alcubierre drive. Another test involves a ring of ceramic capacitors that are charged to tens of thousands of volts. The aim is to create negative vacuum energy. So, as NASA is now on the case, a warp drive may one day become a reality. According to the Star Trek encyclopedia, warp factor 9.99, in the original series, is 997 times the speed of light. It would take a ship travelling at that warp factor over 100 years to cross the Galaxy.